For a long time at the company I work, our signatures were something that varied quite a bit. Now, thankfully, there’s a policy about it. You may be surprised that I say thankfully since people in general don’t like to be told what to do. Two reasons: 1) one less decision I have to make and 2) lots of people in the company won’t come up with nice signatures, even if you will. Go to ‘Settings’ > ‘Configure KMail’ and a dialog window opens. In the ‘Identities’ section/tab, select the Identity for the signature you want to add and click the ‘Modify’ button on the right. Or just double click the Identity in question. 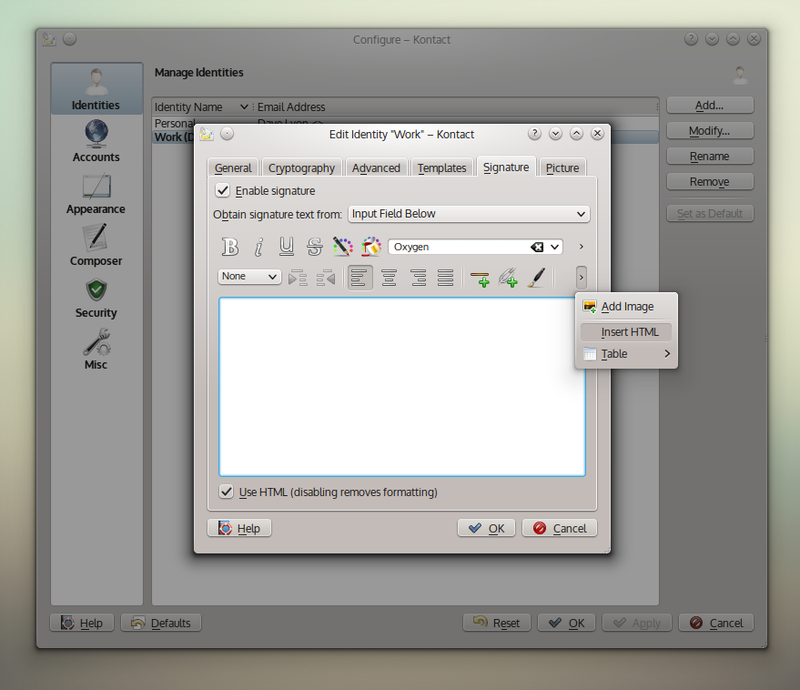 Another dialog window opens. Click the ‘Signature’ tab along the top. Check ‘Enable signature’ at the top of the tab. You have three choices in the select next to ‘Obtain signature text from:’. You can enter text, append a file, or get output from a program. The latter is a fun option if you want to run a script to do random or date dependent things in your signature. I’ll let you play with that option- I don’t have time. Appending doesn’t work for HTML, so we’re going to opt for ‘Input Field Below’. Check the ‘Use HTML’ checkbox at the bottom of the tab area. You now have some rich styling tools. I found them adequate if quirky. The size of the dialog window hides an even quicker option however. Next to the ‘Format Painter’ (brush) icon is the tiny arrow pointed right hiding further options. Within that group is ‘Insert HTML’! Yes! I think you’ll save yourself some time if you lay it out elsewhere and paste it in here. That will at least give you a head start. Big caveats- like all email, if you specify a font the recipient doesn’t have they won’t see that. Also, pasting in HTML left all the images broken in my editor. BUT when I sent the email with the broken images in my signature and checked another email account they show up fine. So KMail is apparently just choosing to block the external image references. I recommend you specify height and width of the images for proper placement. Also, HTML standardistas should remember that HTML email is still back in the 90s/2000s. The closer you get to Netscape 4 compatible code the more successful you’ll be in various email clients. I can’t believe I just wrote that.